Sewing is an integral part of our family history. Our vast experience in the sewing industry is well known in the Atlanta area. Sewing is in our “blood”. In 1884, William H. Briley was born in a small Alabama town where hard work and principles were instilled in him at an early age. When William turned 25, he became a door-to- door salesman for The Singer Company. At the time, Singer was the foremost leader in the industry. With perseverance and determination, William learned the trade and opened his own business in 1943. 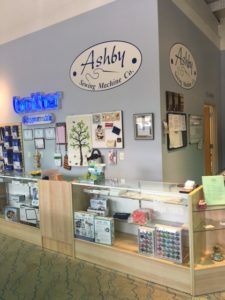 Ashby Sewing Machine Company was born and on its way! The business started to grow and William added his first employee, his wife, to help out. During this time, only used sewing machines were available as metals were scarce. Most metals were used in manufacturing airplanes and ammunition, along with other products for World War II. William “Pap” Briley would take his used sewing machines, by the way of street car, through Atlanta to people homes. William sold these machines on credit to the customers and trusted them personally to pay back the company. Financing was hard to come by in those days, and customer loyalty was most important to William. Starting in 1944, another employee was added. William’s son, Roscoe Briley, began helping his parents in the store. Shortly after WWII, Maurice F. Briley, began to work for his parents as jobs were scarce after the war. Roscoe Briley, and his brother Maurice, saw an opportunity to open his own store in Birmingham, Alabama. Roscoe ended up owning three stores in Alabama and one store in Memphis, Tennessee. After realizing there was more money to be made in the stock market and real estate, he sold all four locations individually and retired from the sewing industry 25 years later. In 1978, Marc F. Briley, son of Maurice Briley, started working with his dad on the weekends and during the summer. In 1986, after two years at Kennesaw College in Marietta, Marc was offered a job with Pfaff American Sales Corporation in Paramus, New Jersey, as a mechanic. But the draw of working with his father and growing the family business was more alluring, and so he decided to not only work with his father, but buy the business. Together the team changed the name to Ashby Sewing Machine Company, Incorporated. In 1993 they opened their second location in Marietta Georgia. In December 1995, the father and son team closed the Atlanta store to focus their energy on the thriving suburban location. In October 2009, Ashby moved into its new and larger store, located at 2255 Old 41 Highway NW, Suite 140, Kennesaw, Georgia, 30144. 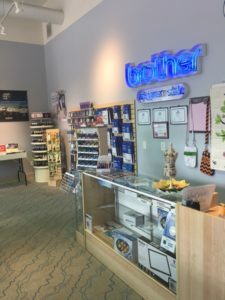 When you are in the area, please stop by the store and meet our friendly and knowledgeable staff who can help you with all of your sewing needs. The home sewing machine industry has come a long way since we started business in 1943. Ashby has rolled with the changes, and kept up with the demands and trends of the ever changing public. We strive to stock a variety of brands to fit every hobby, budget, and need of our customers. As a wise customer, we agree that the most crucial part of selecting a sewing machine is choosing a dealer for your purchase. Our staff is trained and qualified in machine product knowledge and customer service. Every year our employees attend classes and continuing education on our products. Being a well-established dealer in the Atlanta metropolitan area has its rewards. We have acquired great customers over the years that are a part of our family. Choosing Ashby will be your best choice in everything sewing! At Ashby, we love to sew…..and sew it shows!